To celebrate the centenary of legendary British actor Peter Cushing's birth, Signum Books will be publishing Peter Cushing - The Complete Memoirs in May. This compiles the previously published memoirs An Autobiography from 1986 and Past Forgetting: Memoirs of the Hammer Years, which followed in 1988, with The Peter Cushing Story - a 1955 memoir, originally serialised in the press, that has not been seen in nearly 60 years. 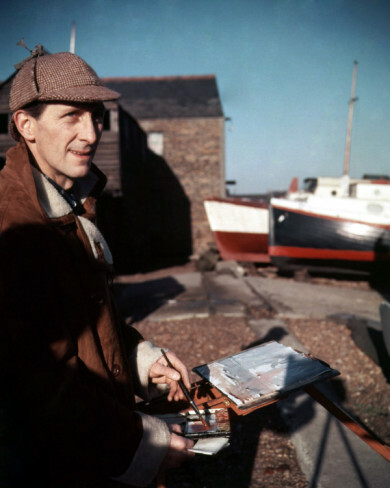 Signum has also worked with the Cushing estate to include 100 rare and previously unseen stills from Cushing’s personal collection, including pictures and illustrations from his scrapbooks. Finally, there is also an 'as complete as possible' chronology of his stage, screen and radio appearances which includes some images of Cushing's endorsements in print advertising. The book features a new foreword from Cushing's loyal secretary Joyce Broughton who was featured in the moving tribute to the actor on the recent Blu-ray release of The Curse of Frankenstein. She initially touches upon an element of Cushing's personality - 'his child-like nature' - which emerges, with increasing regularity, throughout the memoirs and is perhaps symbolised in his love of toys, games and making models. Affectionately known to her as 'Sir', she remained loyal during the devastating emotional after effects of the death of Cushing's wife Helen and looked after him when he was diagnosed with cancer. Actor, critic and film historian Jonathan Rigby also provides an effective, personal account of his admiration for Cushing in his own new introduction. Like many of us who came to adore this quintessentially English of actors, Rigby was, and remains, a great fan and he vividly recollects his first post-graduate encounter with Cushing in Canterbury. 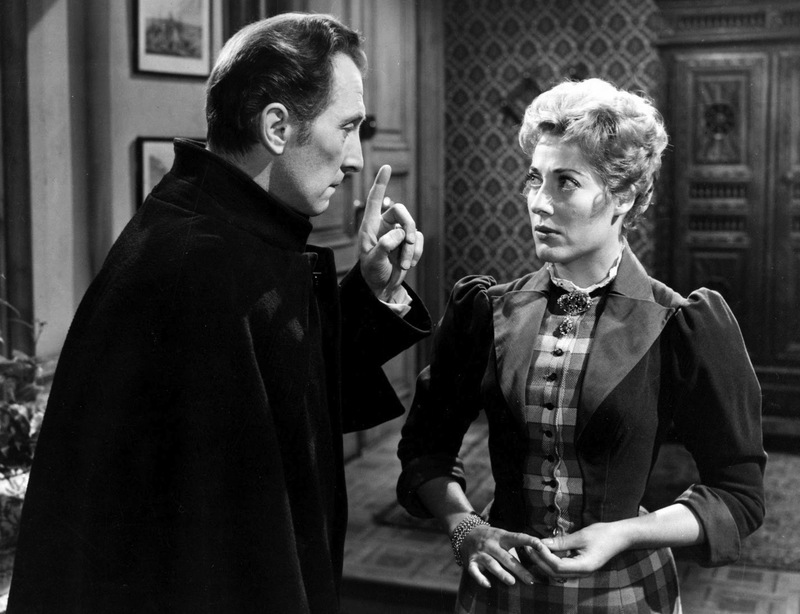 He also regards those twin bastions of British horror, Cushing and his friend Christopher Lee, as 'without doubt the right men in the right place at the right time' while he sketches out a career in theatre and television that eventually brought 'Sir' through the front door of the Hammer house of horror in 1956. Rigby also traces Cushing's later progress through newspaper and magazine reviews and interviews and the great changes in his demeanour after the death of Helen, revealing a genuinely flawed human being we perhaps too readily obscure with his saintly reputation as the ‘the gentleman of horror’. An Autobiography is certainly the book that offers the greater insight into Cushing's childhood and youthful struggle to become an actor, his subsequent marriage to Helen and his meteoric television career. There is a paucity of material about his film career from the mid 1950s onwards that he later attempted to make amends for in Past Forgetting which simultaneously creates a coda to the sad events of the first volume and dips back into his television and film experiences. 1986's An Autobiography details, in a succinct but charming prose style, both an idyllic recollection of childhood - as the subject of some gender confusion thanks to his mother Nellie, chewing bacon rind and worms in the back garden, driving go-carts to school and devising elaborate schemes to earn extra pocket money - and darker moments where childhood fears of the dark and death seem to prefigure his sensitivity and morbidity in later life, his vivid imagination perhaps a clue to some of the Guignol, grand or otherwise, from which he would later make his reputation. 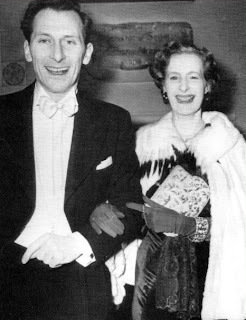 After seeing a production of Peter Pan, Cushing acknowledges that a 'desire to remain ‘The Boy Who Wouldn’t Grow Up’ rubbed itself off on me, which I think becomes self-evident as my story unfolds' and is a corollary to the acknowledged theatrical influence of his Uncle Bertie's 'artistic temperament', his Aunt Maude's escapades on the stage in South Africa and his grandfather Henry William Cushing's membership of Henry Irving's company. Ironically, the latter was a separation by small degree from Dracula author Bram Stoker who was manager of Irving's Lyceum Theatre. The other relationship in childhood which provided Cushing with some much needed stability was the one with his brother David. David, rather than his father George, offered 'Brighteyes' fatherly counsel on the facts of life, taught him to ride bikes and drive cars, did his homework and collaborated with him in all sorts of imaginative derring-do inspired by Toms Mix and Merry. Cushing's athleticism in his acting roles was clearly a result of the various adolescent scrapes he put himself through during summers also dominated by collecting cigarette cards and birds' eggs. His brusque father didn't know what was to become of a lad who got 'top marks in art: nil for everything else' and, though lauded for swimming and athletics, 'played the lead in nearly all the school productions'. Cushing also observes he had 'an ability to fall down a cliff without breaking my neck: and just for good measure, an appetite like several horses'. His dad, reluctantly appreciating his talent as an artist, managed to land him a job in the Drawing Office of the Surveyor’s Department at the Coulsdon and Purley Urban District Council and even though Cushing's childhood was over, his child-like view of the world and his skills as an artist never deserted him. He may have spent three years as nothing more than a 'glorified office boy' but he was already mapping out his ambitions. A succession of UDC activities - administering street numbering and collecting coins from public loos - only concealed his true calling, one fuelled with ventures to the West End on his day off to sneak past stage door staff 'to revel in that intoxicating atmosphere and heady odour - a combination of dust, size, distemper and grease paint; to stand on the stage in the set that was prepared for the next performance'. The next performances for Cushing were in school plays and amateur theatricals as he feverishly bombarded adverts in The Stage with willing responses. Clearly a sensitive soul, his early failure to break into acting drove him to the cliff path above Orcombe Rocks where his intention to end it all was thwarted by the distracting antics of coastal birds. On the train journey back home, he read about scholarships at Guildhall School of Music and Drama and, thanks to his love of the natural world and his sheer determination, he was back on course. It's hard now to reconcile the perfectly and precisely spoken Cushing with the one who auditioned in front of Allan Aynesworth. He declared of the young man's talents, or lack thereof, 'Take him away! His voice offends me!’ That Cushing was deadly serious about an acting career is hilariously recounted in his attempt to remedy his vocal incompetence. Marching across the North Downs enunciating a series of recommended vocal exercises of the 'How Now, Brown Cow?' variety, much to the chagrin of courting couples in the long grass, the actor-to-be was ordered to ‘put a sock in it’. However, after much practice, the Guildhall eventually accepted him. By 1935, he had performed in two end-of-term plays and used this experience as leverage in continuing attempts to get paid employment in the theatre. It was actor-manager Bill Fraser who took pity on him and offered him a job as ASM at the Connaught Theatre in Worthing. Cushing's recollection of this 'audition' is sweetly self-deprecating and delightfully funny, delivered with aplomb. From there he regales us with tales of creating prop food for productions (sliced bananas and redcurrant jelly standing in for bacon rashers) that he would often tuck into at the end of performances before heading for bed and of his 'duties' at the Grand Theatre, Southampton, many of which were in fact time-honoured theatrical gags inflicted on a terribly innocent and gullible Cushing by a Cockney stage carpenter. After gaining much experience in rep, he joined Harry Hanson's Court Players and met his lifelong friend Peter Gray. Gray was clearly another fatherly influence, gently steering the 25-year-old Cushing's education before war separated them and Cushing headed for Hollywood in January 1939 when his father presented him with a one-way ticket to America. Gray, providing the introduction to Cushing's 1988 memoir Past Forgetting, recalls their first encounter on a train at Euston and sharing digs in Nottingham under the auspices of that now extinct creature, the theatrical landlady. He also gets the measure of Cushing's psyche, formed in early childhood, when he exclaims, 'in every good actor there is an element of Peter Pan, the boy who wouldn’t grow up – a fixation in that period of childhood when total suspension of disbelief in a fairy tale is possible and even natural'. In New York, prior to Cushing's train journey to Los Angeles, Robert Morley's advice to him about breaking into Hollywood was, 'It’s very crowded, you know, dear boy. Why don’t you just go there for a holiday? Have you brought your bathing costume with you?’ However, 'plumb British' Peter Cushing hit the ground running. He gained an introduction via Larney Goodkind of Columbia Pictures to the studios of Edward Small Productions and found himself doubling for Louis Hayward on James Whale's production of The Man in the Iron Mask (1939). Cushing's tales of his experience as a chancer who had neither acted on film before nor fenced with a sword and ridden a horse are, naturally, the very essence of the folklore surrounding the many ingenue British actors who suddenly found themselves doing what they long dreamed of during the golden age of Hollywood. 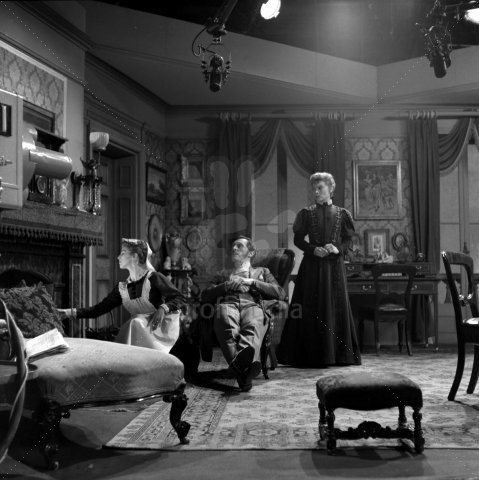 And, for Cushing, that included demolishing the set in the process. He returns to the scene of the crime with more tales of his horsemanship in Past Forgetting and his love of westerns enshrined in the making of John Gilling's Fury at Smuggler's Bay in 1961. His star seemed to be in the ascendant in California and he spent a memorable week on the Laurel and Hardy film A Chump at Oxford (1940), played cricket with Basil Rathbone, David Niven and Boris Karloff and was utterly star struck by Loretta Young. George Stevens screen tested and then offered him the part of Joe Shand in Vigil in the Night (1940), working with Carole Lombard. Despite living the Californian dream of endless rounds of tennis and dinner parties, Cushing became desperately homesick. Despite the likelihood of being groomed for stardom, he decided to return home via New York and Canada on a journey made more complicated by the war and its transport restrictions. He tried to earn his fare home working first as a car park attendant, then as an illusionist's assistant, advertising toothpaste on the radio and, finally, sharing porridge and social security with actor John Ireland and his wife. After four months in summer stock, he was talent spotted by Theatre Associates for a Broadway production of The Seventh Trumpet. It was a short two week run curtailed by customary hostility from the Broadway critics. 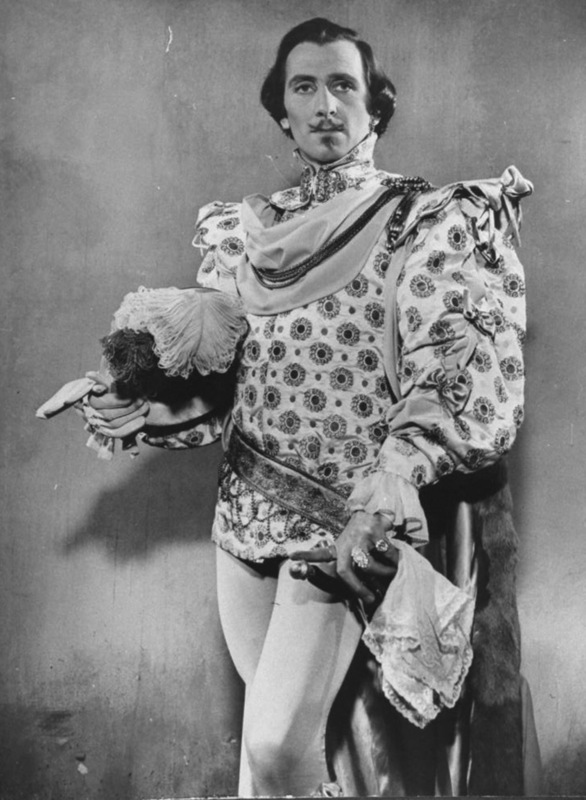 Back home Cushing found work via Basil Dean's ENSA (troop entertainments affectionately known as 'Every Night Something Awful') and a touring production of Coward's Private Lives. A beautiful letter is reproduced at this juncture, a letter in which Helen Beck described meeting Cushing for the first time as she arrived to replace Sonia Dresdel in the lead role. Helen was a Russian immigrant, formerly of revue and rep companies, one time secretary to Jessie Matthews and the survivor of a terrible first marriage. 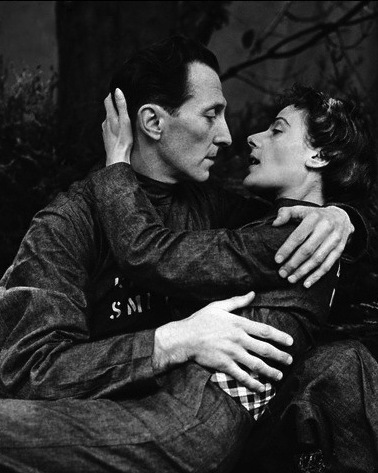 Their relationship was sealed as Private Lives played in drill halls and aeroplane hangars to the sound of anti-aircraft guns and shells whizzing around their ears and when one evening Helen attempted several times to smash an unbreakable record over Cushing's head during a fight scene in the second act. 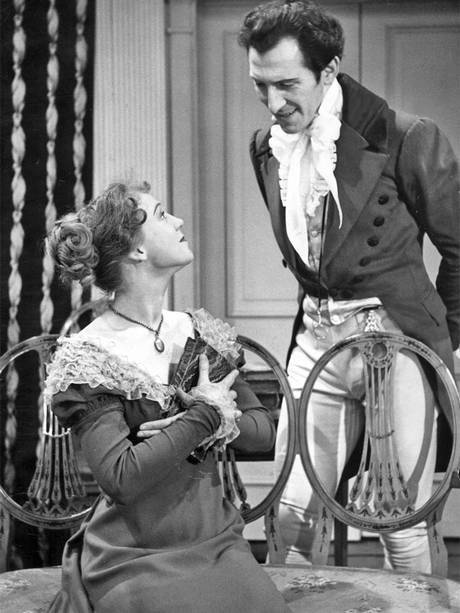 He and Helen spent the war years working in the West End, at the ‘Q’ Theatre in Chiswick, or touring in plays with very short or curtailed runs. Fate was not altogether kind on the Cushings. Helen endured a hysterectomy and still birth while Peter desperately sought work and looked after her. Touring also meant they could dodge the V1s and V2s now raining down on London and the South. After success in Edith Evans' revival of Sheridan's The Rivals in 1945, Peter spent nine months unemployed but he was ever one who would turn his hand to anything and a painted scarf he had given to Helen at Christmas led to getting paid for ten months as silk screen printer for a Macclesfield textile mill owner. It was his refusal to put on an American accent for Larry Olivier in his production of Born Yesterday that endeared Cushing to him when he came to casting Osric for his 1948 film of Hamlet. 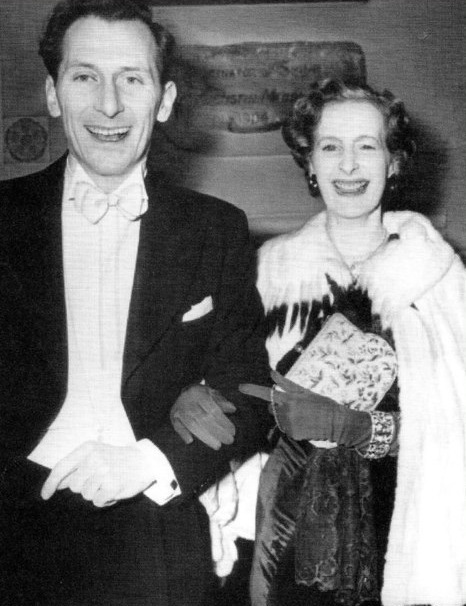 Cushing's anecdotes offer a warm recollection of working with Olivier, false teeth and all and, by contrast, a vivid memory of sitting, freezing to death with Helen, in an unheated theatre box with the Oliviers and Noël Coward. He and Helen went on tour with Larry's company to Australia, presenting The School for Scandal, Richard III and Skin of Our Teeth to 'tumultuous applause'. Despite this, by 1950 Cushing and Helen were almost broke again and during a rehearsal for Olivier, Cushing broke down and, as a result, then spent six months recovering from said nervous breakdown. Again, great honesty about his sensitivity towards work and his relationship with Helen is what strikes the reader here. Some smashing and very descriptive pages cover his stay in Manchester while understudying Robert Helpmann at the Opera House and his depressing search for a cafe open on Sundays before we get to the slow realisation of his impact on television audiences. This of course culminated with his landmark role as Winston Smith in Rudolph Cartier's adaptation of Nighteen Eighty-Four. His anecdote about the rather dopey pair of rats, provided by a rat catcher, and sacked for their poor performance in the terrifying torture scene is priceless but their more effective replacements, tame white rats dyed brown, helped seal his reputation as ‘The Horror Man of the BBC’. His second volume of autobiography, Past Forgetting, includes a welcome return visit to this period with witty stories about the days of live television including Wilfred Lawson's ad-libbing, burning sets, missing revolvers and the AFM's need to cut the sound on broadcasts when nerve racked performers stopped dead and line prompts were required. A series of comic memos between Cushing and Peter Ustinov as they made The Moment of Truth at the BBC in 1955, again with Cartier, is one of the highlights of this volume. Cushing, in time honoured fashion, also drops in some wonderfully amusing nuggets about many of the grand dames of the theatre, including Edith Evans and Athene Seyler. A story about Seyler's billing for a touring production of Weep for the Spring is a treat. Always in the background in An Autobiography is his concern for Helen's health and, while there is a travelogue that covers some of his filming for Hammer and other film studios in Spain, Switzerland and Israel and he recounts the arrival of his faithful secretary Joyce Broughton, the focus inevitably shifts towards Helen's eventual and tragic decline. Cancelling his filming on Hammer's Blood From the Mummy's Tomb in 1971, Cushing brought his terminally ill wife home, from her hospital stay, to nurse her in her final days. The final chapter is a heart rending expression of grief, a grief that stayed with Cushing until his own death in 1994. Past Forgetting was a welcome coda and yet Cushing's desire to be reunited with his late wife dominated much of his life and career from 1971 onwards and he contemplated, via poisoning or electrocution, a hastening on of the process such was the depth of his abandonment. Helen was, after all, his most powerful of confidantes and bolstered his confidence in times of professional doubt and his only salve was to plunge into a period of continuous work, making 32 films in the space of a decade. He contemplates a running list of his memorable movie deaths, including his demise in 1974's Madhouse 'by falling into a glass tank full of poisonous spiders, following a titanic ding-dong with the old rascal' Vincent Price and being 'blown to smithereens by those two intrepid young lads, Harrison Ford and Mark Hamill, who managed to blow up my little pied-à-terre' in a little B movie called Star Wars (1977). He also considers the moral imperative behind characters such as Baron Frankenstein and reflects on his friendship with Christopher Lee and working with the likes of Alan Ladd and Sammy Davis Jnr. There was also great comfort in new friendships, such as the ones he established with Kevin and Freddie Francis. It was the death of Helen that informed his highly regarded performance in the role of the old recluse Arthur Grimsdyke in the Amicus portmanteau horror film Tales from the Crypt (1972) directed by Freddie Francis. 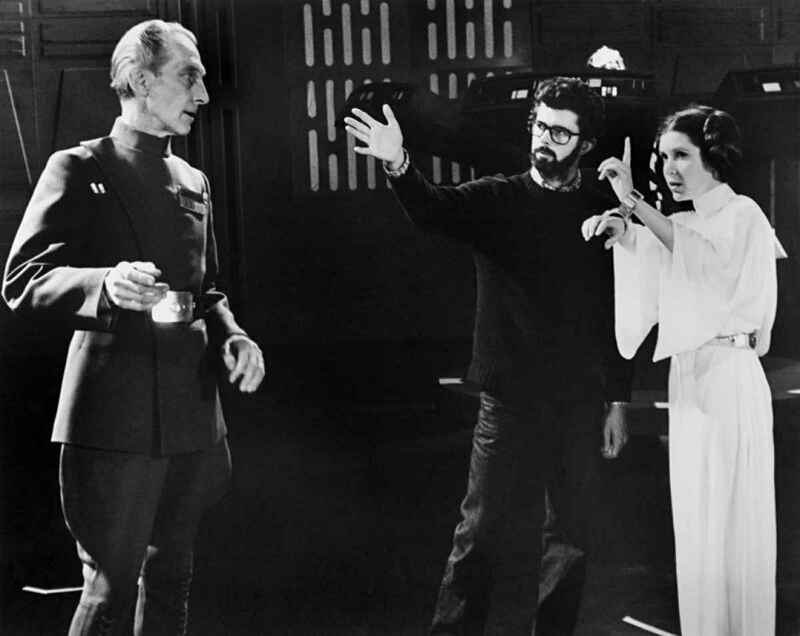 In 1975 he worked on The Ghoul, produced by Kevin and again directed by Freddie, and describes how he empathised with the lead character's emotional state and, by using a photograph of Helen, found true motivation for the role. The sadness was dispelled by his rather amusing take on the 'The 12 Days of Christmas' which he sent to his good friend Peter Gray and a return to the stage, after an absence of ten years, to play in Henry James's The Heiress at the Horseshoe Theatre in Basingstoke. Talk of the theatre prompts a recollection of his work on the 1943 stage version of War and Peace, 'a mammoth 32-scene production that lasted nearly four hours', as well as some amusing anecdotes and bons mots from designers and actors alike. Acting, he understood, often took him beyond the call of duty, be that learning magic, how to play snooker, ride a camel or dance with Eric and Ernie. Past Forgetting's epilogue reveals his survival, despite the odds, from cancer and concludes the volume with a heartfelt tribute to Joyce and Bernard Broughton, who nursed him through his illness, and a sense that life continued for the much loved actor, one inspired by 'my belovèd wife who was, is, and ever will be, the light of my life' and filled with acting, painting and public appearances. 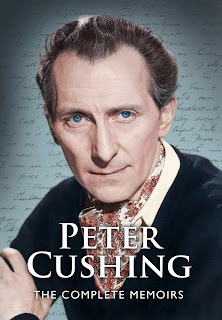 For those who have only just discovered the inestimable talents of Peter Cushing, The Complete Memoirs is a moving, funny, revealing and self-effacing introduction to a very special, much missed actor. For his many longtime fans there is still much pleasure in revisiting the memoirs, reading and seeing the rarer material now included here. 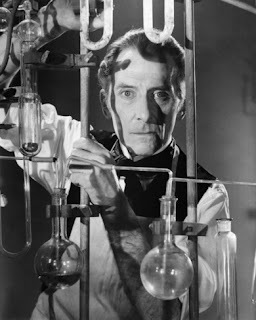 I am indebted to The UK Peter Cushing Appreciation Society for their incredible collection of images and no copyright infringement is intended in the reproduction of some of those images.